With the World Cup getting ever so closer, it’s time for another group review, along with another stadium review. Also this blog will give you an added bonus feature. Anyways lots to anticipate. Lots to focus on here. -Brazil (2)- I’m not going to bring up the humiliation Brazil went through during the 2014 World Cup. I will say it has been an interesting four years since. The first two years were the hardest, but also very hopeful. Dunga had assumed the role as head coach and things looked promising, until the 2015 Copa America. There, they were ousted in the quarterfinals. For the next year, they struggled in international play and were even ranked low in World Cup qualifying. Then at the 2016 Copa America, another early ouster: in group play. With the Olympics coming soon, they changed to coach Tita, who was most experience in play and coaching with Brazil’s Campeopnato Brasiliero league. The change has worked to success. Brazil won gold at the 2016 Olympics and won every World Cup qualifying game since. Brazil would become the first team to qualify for this World Cup. The Seleção’s success continues. It has not lost a game since the 2016 Copa America and even won a friendly against Germany 1-0. Brazil is one team coming to Russia not simply for victory, but redemption as well. -Switzerland (6)- Switzerland is one team that’s been waiting long and hard for their big breakthrough. They have a lot to prove, but have often come up short. The last time they won a knockout game was back in 1938. Their best ever result is the quarterfinals which was last achieved in 1954 which they hosted. They’ve grown in talent and prowess in recent years. At the last World Cup, Xherdan Shaqiri delivered a hat trick en route to qualifying to the Round Of 16, but their trip to the Cup was ended by Argentina. The Swiss team has had its strongest years in this past while. This is the fourth straight World Cup they’ve qualified for. The team features defender Stephan Lichtsteiner, midfielders Shaqiri and Granit Xhaka and striker Haris Seferovic. The team is coached by Bosnian Vladimir Petkovic. The Swiss team come to Russia with a good track record in this past year with wins against Hungary and Greece and a 1-1 draw against Spain. However they also had to endure a 2-0 loss to Portugal. Switzerland comes to Russia with a lot to prove. -Costa Rica (25)- Costa Rica is a team that will surprise you when you least expect it. At the last World Cup, the team wound up in Group D where they would have to play Italy, Uruguay and England. Just about everybody, including myself, thought Coast Rica would be the team least likely to qualify. Instead they topped the Group with wins against Italy and Uruguay and drew against England. A win against Greece on penalties in the Round of 16 took them to the quarterfinals for the first-time ever. Despite losing to the Netherlands on penalties, Costa Rica defied all expectations and set a new standard for the team. This year’s team features a new coach in Oscar Ramirez. Their star striker Bryan Ruiz from Sporting CP is back. Many of the team’s top players play for MLS. In the past year, Costa Rica has had good wins against Northern Ireland, Scotland and the US. However it’s had to endure losses to Hungary, Spain (5-0) and Tunisia. Who knows? 2018 could be another Cinderella story like 2014. -Serbia (35)- Serbia is a national team that’s rather young: only 12 years old. Its national team may not have the experience as most of the teams present in Russia. However they’re a team of surprises. If you remember the 2010 World Cup, they won against Germany 1-0. The team of the former Yugoslavia has had way better success in the past; even going as far as fourth. Serbia hopes one day to emulate the past success. The team does show promise as they won the under-20 World Cup in 2015. Possibly as a result of their win in 2015, seven players of the Serbian team were born in 1995 or later. The team also features top veterans like defenseman Branislav Ivanovic and goalkeeper Vladimir Stojkovic. In the past year, they’ve acquired notable wins against China, Ireland and Nigeria. However they’ve had notable losses to Morocco and Chile. Don’t rule Serbia out for 2018. And there’s my rundown of the teams from Group E. As for who will qualify for the Round of 16, I believe it will be Brazil and Switzerland. Spartak Stadium is one of two venues in Moscow that will be hosting matches for this World Cup. Its current name is Okritie Arena after the Russian Okritie Bank, but will be known as Spartak Stadium during the World Cup. The stadium cost $430 million to build. Actually the second Moscow stadium that was planned for the World Cup was VTB Arena, which was to combine a soccer stadium and ice hockey rink all in one. Instead Spartak Stadium was build first and won the right to be an official venue. It was even one of the four venues that played host to last year’s Confederations Cup. After the World Cup, the stadium will be the host venue for FC Spartak Moscow and the Russian national team. Stadiums aren’t the only thing I will be focusing on in this World Cup. I will also focus on other things unique to the World Cup. For this first bonus, I will be focusing on the official World Cup Ball. It’s a given that with each world Cup, Adidas delivers a match ball that is designed to take football technology to a new level. Some like 2014’s Brazuca are welcomed well. Some like 2010’s Jabulani hit a sour note with the players. For 2018, Adidas launches Telstar 18. The ball was unveiled by Adidas on at its official presentation in Moscow on November 9, 2017 and it was Lionel Messi that announced the name. Telstar 18 plays tribute to the original Telstar ball (from 1970) which was Adidas’ first ever official World Cup ball. This Telstar ball features six textured panels that aren’t sewn together, but seamlessly glued together. The ball has an embedded near-field communication chip which allows the consumer to access information personalized from the ball and including interactivity themed on the upcoming World Cup. And there you have it. That’s my review of the Group E teams. Only three more groups to go! Time sure does pass fast! Stay tuned! A restaurant owner (played by Murilo Benicio) and his waitress (Luciana Paes) provide a night of chaos and madness in Friendly Beast. The VIFF is a chance for some eccentric ideas to come across on the big screen. Friendly Beast is a Brazilian film that allows insanity to go wild. The film begins at a nice small restaurant in Brazil. The owner Inacio takes pride in his business and appears to have things cool and under control. He may be nasty to some of the lesser workers, but what restaurant owner isn’t? Waitress Sara seems to be the one who most helps him without question. During the night, Inacio is dealing with a couple that appear to be like any other. Then a robbery happens. Instead of letting the two take what they need, Inacio attacks them and holds them captive. It doesn’t stop there. Inacio then makes his ‘lesser’ workers captive too, and then the dining couple! Sara willingly goes along. Inacio uses his time to antagonize and even torture the people he holds hostage. He even accuses kitchen-hand Djair of planning this robbery. We learn that Sara also has the same diabolical urges as Inacio and she takes the same pleasure in inflicting torture, especially in the female diner. It goes from one thing to the next, from torturing one person to killing another. Whatever Inacio commands, Sara follows along. Inacio even comes across as threatening to her, too. However Sara gets even with him in the end and turns the tables. Inacio is not so much the man in control! What we have here are common things we’d find in a horror film. They’re also things that can parlay into one of those horror movies that come off as dreadful. We have a restaurant owner who appears to be in control on the inside. He appears no nastier and no more controlling than your typical restaurant owner. That all changes after the failed robbery. Son he terrorizes the robbers, then his coworkers, then the dining couple. Then the waitress joins into his sinister plan, only to be the one who overtakes him in the end. Yes, the making for something dreadful. However what keeps it from being dreadful is that the film is well-written and well-acted throughout. In order for Inacio to suddenly become sinister when the robbery happens, the transfer to madness has to work well. It also has to work for Sara when she too becomes part of this mad scheme. If you saw the movie, you’d see that it worked out well. Inacio first making victims of the robbers and them making everyone in the restaurant captive, including the couple dining out, worked out in the film and did not come off as ridiculous. Sara suddenly controlling Inacio also worked too, and it added for a surprise twist for an ending. A film like this even has to have some dark sick humor added to this as well. There are elements of that too, like stealing a dead person’s earrings to seduce someone, or flirting in the presence of a man who’s bleeding out. There’s also that scene where Inacio makes a phone call to his wife trying to sound cool and collect and that it’s just another day at the place, when it couldn’t be further from the truth! Gabriela Amaral did a very good job in writing and directing a bizarre and darkly humorous horror movie that’s big on thrills and intrigue, but puts the right limit on the gore. Betcha didn’t think a woman director/writer can create a good horror film, did you? Murilo Benicio did a very good job with the character of Inacio in turning him from a typical restaurant owner to a Charles Manson-like madman. Luciana Paes also did a very good job in making Sara go from a regular waitress to sinister to being the one who overtakes Inacio. The other actors in their minor parts also did well and contributed greatly to the film. Friendly Beast is a surprising horror film. It’s well-written, well-acted and does not come across as cheesy and ridiculous like so many horror films. Brazil’s athletes have won a total of 108 Olympic medals in 14 sports. Whenever an Olympic Games happens, I usually publish a blog relating to the host city or the host country. In this case, I’ll be focusing on Brazil’s past Olympic success and it has a lot. Brazil has won a total of 108 Olympic medals: 23 of them gold. That ranks them 33rd for all-time medals at the Summer Olympics. That’s also the most of any South American nation. The very first Olympic Games Brazil sent an Olympic team to was the Antwerp Games of 1920 and they debuted with a bang, literally. Brazil won a gold, silver and bronze in various shooting events. The gold going to Guilherme Paraense in the rapid fire pistol event. After the Antwerp Games, Brazil’s Olympic results consisted of woes up to World War II. They sent a 12-athlete team to Paris in 1924, a 67-athlete team to Los Angeles in 1932 which I will focus later on, and a 73-athlete team to the Berlin Games of 1936. All of which resulted in not a single medal won. Nevertheless there were some rays of hope. The biggest being from swimmer Maria Lenk. Just after finishing out of the final at her event in Berlin, she would set a world record in her event. She made history as the first Brazilian swimmer ever to hold a swimming world record. The Maria Lenk Aquatic Centre which was built for the 2007 Pan Am Games and will host three aquatic sports for Rio 2016 was named in her honor. One of Brazil’s most famous Olympic stories is not exactly a positive one. It involved their Olympic team in 1932 as the world was going through the Great Depression at the time. Brazil was also hit hard during the Great Depression and their Olympic team were also feeling the heat. In order to raise funds for the team, the athletes would sell coffee beans at every port their ship, the Itaquicê, would dock at. Once the shipped docked at San Pedro, the authorities at the Port Of Los Angeles charged Brazil $1 for each athlete they let off the ship. The Brazilian team first let off the athletes with the best medal chances and swimmer Maria Lenk who would become the first Brazilian female to compete at the Olympics. However it wasn’t all over. The Itaquicê then sailed to San Francisco to sell more beans to fund the other athletes. It was successful enough to give the water polo, rowing and athletics athletes enough funds to compete. However the lack of funds meant 15 athletes could not live out their Olympic dreams and thus sail back to Brazil on the Itaquicê. The best result for the team was a 4th place in rowing. Brazil’s first Olympic great: triple-jumper Adhemar Ferreira da Silva. After World War II, Brazil would get better in sports at the Olympic Games but it would mostly go unnoticed for decades. The biggest notice came in the men’s triple jump. Even before the Helsinki Games in 1952, Adhemar Ferreira da Silva held the world record in the men’s triple jump. In Helsinki, winning was an ease for da Silva as he won by almost 10 inches and set a new world record in the process. Da Silva would repeat as Olympic champion in 1956. Da Silva would prove himself to be one of the greats of triple-jumping as his career would not only include two gold medals but he’d also break the world record five times in his career. Da Silva would prove to be inspiring to Brazil as there would be two other male triple jumpers who would win Olympic medals and break the world record too. Unfortunately for Brazil, Da Silva would prove to be Brazil’s only Olympic champion up until 1980. With the exception of a silver in the triple jump in 1968, Brazil’s Olympic teams after World War II would come home with nothing but bronze in that meantime. Sure they’d always have at least one medal but a single silver and the rest bronze was pretty much it from 1960 to 1976. It’s not to say it was all bad as Brazil would expand its abilities to win medals in other sports like basketball, swimming, sailing and judo. The boycott of the Moscow Games in 1980 may have kept other nations at home but Brazil didn’t cave into the pressure. Their participation at the Moscow Games boosted its sporting confidence. The team won its first gold medals since Da Silva: two in sailing. These Games would later open the doors to Brazilians in sailing as success would continue. Brazil has won a total of 17 medals in sailing: six of them gold. The team in 1980 would also win bronzes in swimming and triple-jumping. 1980 would prove to be a boost of confidence to their Olympians as more success would follow. Los Angeles in 1984 would be the stage for Joaquim Cruz as he won gold in the 800m: Brazil’s first gold in a running event. Brazil would also win an additional five silver and two bronze at those Games. Possibly making amends for 1932. Medals came in judo, volleyball, sailing, swimming and their first-ever men’s football medal: a silver. Up until 1984, professionals weren’t allowed to compete at the Olympics which meant Brazil could only send ‘diluted’ teams to the Olympics which kept them out of the medals. Professionals were allowed to compete at the Olympics for the first time in 1984 and it opened the floodgates to Brazil–although not completely– to send better football teams to the Olympics. Dunga was part of the silver medal-winning 1984 team. 1992 would only be a case of three medals in three different sports but it was still a good showing for Brazil as it was their second Games where they returned home with two golds: in man’s volleyball and in judo. The volleyball gold would be key as it would pave the way for future success for the Brazilian team at the Olympics. As Brazil’s economy would grow over time, so would their athletic prowess. Ever since the 1996 Games in Atlanta, the Brazilian Olympic team would always leave each of the last five Games with at least ten medals or more. In fact 70 of the 109 total medals Brazil has won before the Rio Games were won in the previous five Summer Olympic Games. Atlanta was the very first sign of the Brazilian sports boom. The nation won a best-ever total of 15 medals including 3 gold. The introduction of beach volleyball led to Brazil taking the top 2 spots in the women’s category. They also had continued success in sailing, judo, football (featuring Ronaldo) and swimming but they also won their first ever equestrian medals as well as their first medals ever won by female athletes. Sailors Robert Scheidt (left) and Torben Grael show off their gold medals from Athens 2004. They are Brazil’s most medaled athletes. Both men have won five medals each, including two gold. 2000 was a case where Brazil didn’t win a single gold medal but still left Sydney with a total of 12 medals. Success continued in swimming, track, volleyball, judo, equestrian, sailing and volleyball. They sure made up for their no-gold disappointment in Athens in 2004 with five golds of their ten medals: their most golds ever. Actually it was originally four golds but a bizarre doping situation led to five. In equestrian show jumping, Rodrigo Pessoa finished second to Ireland’s Cian O’Connor. However it was later revealed months later that the doping sample from O’Connor’s horse went missing and was finally tested in November of 2004 resulting in a positive test. That bumped Pessoa up to Olympic champion: Brazil’s first ever equestrian gold medalist. Bizarre but glad it was finally set straight. Another example of Brazilian sportsmanship came in the men’s marathon. Vanderlei de Lima was leading the race when out of nowhere, an Irish defrocked priest hounded him and disrupted his run. Fortunately de Lima was able to get back to running and finish third. When he received his bronze medal, he was also given the de Coubertin award for fair and courageous play. 2008 in Beijing saw their Olympic prowess taken another step further as they won three golds and a best-ever 16 medals. First-ever golds for Brazil came from swimmer Cesar Cielo Filho and long jumper Maurren Maggi in women’s athletics. This was also the first Olympics where both the men’s and women’s football teams won medals: silver for the women and bronze for the men. London 2012 was another increase in the medal haul with a best-ever 17 medals including three gold. The women’s volleyball team repeated as Olympic champions but the biggest gold-medal surprise came from gymnast Arthur Zanetti on the rings as he won Brazil’s first-ever gymnastics medal: gold on the rings. The team also won three medals in boxing–their first since 1968–and Yane Marques became the first Brazilian to win a modern pentathlon medal when she won silver. A footnote to ad: Brazil has competed in every winter Olympics since the Albertville Games of 1992. Their best result is a ninth in snowboarding back in 2006. No kidding Brazil wants to give their home country something to be proud of. They will field a team of 465 athletes in 29 sports and they hope to give Brazil its best-ever medal total. The men’s football team has brought Neymar–who was part of Brazil’s silver medal-winning team in 2012– on the squad. Marta is back on the women’s squad. And a unique situation in sailing where two of Torben Grael’s children–Marco and Martine– are competing in the sailing events. As the athletes in Brazil compete in Rio de Janeiro, they will compete with a sense of pride. They will also compete having a set of heroes they’ve grown up admiring and idolizing and hopefully create new heroes for the next generation. The stage will be set. -Brazil (5): Okay, we don’t need an explanation. We all know the story of how they all fell apart at the World Cup. What most don’t know is how much Brazil has improved since. After the World Cup, Dunga returned as coach of the national team and it seems like the games since have been a case of Brazil getting its groove back. They’ve won every game since including winning 3-1 against their traditional ‘Achilles heel’ France. They appear in good shape to redeem themselves at this Copa. This will be the first major tournament to redeem themselves. They could win it. However rebuilding a team doesn’t happen overnight. Even if they don’t win, as long as they show the world they’re getting back on track, that should matter. Ok, nós não precisamos de uma explicação. Nós todos sabemos a história de como todos eles se desfez na Copa do Mundo. O que a maioria não sabe é o quanto o Brasil melhorou desde então. Após a Copa do Mundo, Dunga voltou como treinador da equipe nacional e parece que os jogos desde ter sido um caso do Brasil recebendo de volta seu sulco. Eles ganharam todos os jogos desde incluindo vencer por 3-1 contra a sua tradicional “calcanhar de Aquiles” da França. Eles aparecem em boa forma para redimir-se neste Copa. Este será o primeiro grande torneio de redimir-se. Eles poderiam ganhar. No entanto reconstruir uma equipa não acontecer durante a noite. Mesmo se não ganhar, desde que mostrar ao mundo que eles estão recebendo de volta aos trilhos, que deve importar. -Colombia (4): This is the time for Colombia’s best era. Even though they only made it to the quarterfinals at the World Cup, they impressed the world with their fair play and immense talent like striker James Rodriguez and Juan Cuadrado who have since gone on to be the hottest new talents of the year. Since the World Cup, Colombia has only lost to Brazil and have scored key wins against the United States and Costa Rica. They could top Group C but it all depends how well they play against Brazil. They could even win the Copa. It all comes down to playing like a top notch team. They already have an excellent reputation happening and whatever happens in Chile can add to it. -Venezuela (69): Venezuela is the only CONMEBOL country never to have qualified for a World Cup. Venezuela is possibly the one CONMEBOL country whose favorite sport is not football. They take better to baseball and basketball. However Venezuela has shown improvement in recent years. They finished fourth at the Copa in 2011: the first time they ever made the Top 4 at the Copa. They didn’t qualify for the 2014 World Cup but they did finish sixth in the CONMEBOL playoffs. Venezuela hopes to add to their reputation in Chile but they face a stiff challenge. Their only wins in the past twelve months came to Peru and Honduras. 2015 is another chapter for a team seeking their first breakthrough. This will be a tight one between Brazil and Colombia. I think Colombia will top the group with Brazil second and Venezuela third. And there you have it. My third and last review of the Copa America groups. Tournament begins today and I’m sure it will be exciting. It may compete for attention against the Women’s World Cup but it should have a lot of fanfare nonetheless and a lot of excitement. My next blog on the Copa will come after the quarterfinals. Stay tuned! -Brasil (5): Muy bien, no necesitamos una explicación. Todos conocemos la historia de cómo todo se vino abajo en el Mundial. Lo que la mayoría no sabe es cuánto Brasil ha mejorado desde entonces. Después de la Copa del Mundo, Dunga volvió como entrenador de la selección nacional y parece que los partidos desde haber sido un caso de Brasil conseguir su ranura espalda. Han ganado todos los partidos desde incluyendo ganar 3-1 en contra de su tradicional ‘talón de Aquiles’ de Francia. Aparecen en buena forma de redimirse en esta Copa. Este será el primer gran torneo de redimirse. Podrían ganar. Sin embargo la reconstrucción de un equipo no sucede durante la noche. Incluso si no ganan, siempre y cuando muestran el mundo que van a obtener de nuevo en marcha, que debería importar. -Colombia (4): Este es el momento para la mejor época de Colombia. A pesar de que sólo llegaron a los cuartos de final en la Copa del Mundo, que impresionó al mundo con su juego limpio y el inmenso talento como el delantero James Rodríguez y Juan Cuadrado que han pasado ya a ser los mejores nuevos talentos del año. Desde el Mundial, Colombia sólo ha perdido ante Brasil y ha anotado victorias clave contra Estados Unidos y Costa Rica. Podrían rematar el Grupo C, pero todo depende de lo bien que juegan contra Brasil. Incluso podrían ganar la Copa. Todo se reduce a jugar como un equipo de primera clase. Ellos ya tienen una excelente reputación sucediendo y lo que sucede en Chile puede agregar a ella. -Venezuela (69): Venezuela es el único país de la Conmebol que nunca se ha clasificado para una Copa del Mundo. Venezuela es posiblemente el país uno CONMEBOL cuyo deporte favorito no es el fútbol. Toman mejor béisbol y el baloncesto. Sin embargo Venezuela ha mostrado una mejora en los últimos años. Acabaron cuarto en la Copa en 2011: la primera vez que jamás se ha hecho en el Top 4 en la Copa. Ellos no califican para la Copa del Mundo de 2014, pero lo hicieron sexta final en las eliminatorias de la CONMEBOL. Venezuela espera agregar a su reputación en Chile pero que se enfrentan a un duro desafío. Sus únicas victorias en los últimos doce meses llegaron a Perú y Honduras. 2015 es un capítulo más de un equipo en busca de su primer gran avance. Esta será una apretada entre Brasil y Colombia. Creo que Colombia va a liderar el grupo con Brasil y Venezuela segundo tercio. Y ahí lo tienes. Mi tercera y última revisión de los grupos de la Copa América. Torneo comienza hoy y estoy seguro de que será emocionante. Puede competir por la atención contra la Copa Mundial de la Mujer, pero debe tener un montón de fanfarria, no obstante, y mucha emoción. Mi próximo blog en la Copa vendrá después de los cuartos de final. Manténganse al tanto! Like it? That’s an Italian wine bottle shaped in the World Cup. 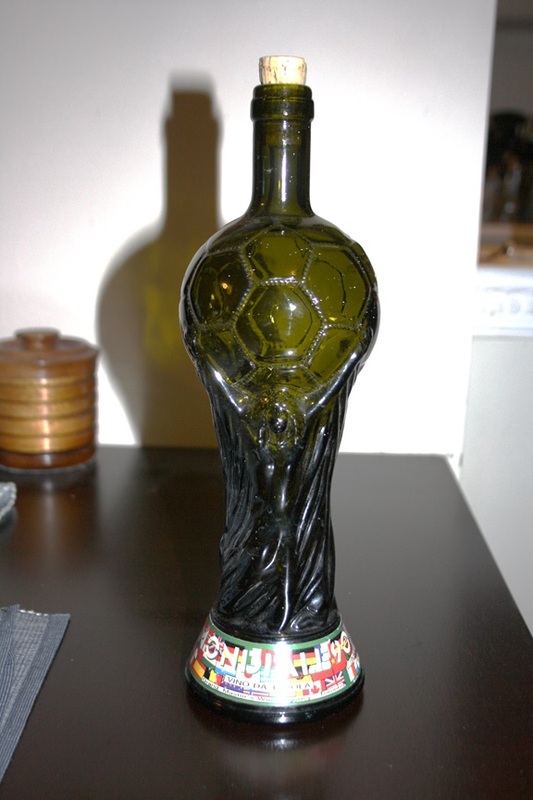 I got it back in 1990 when Italy hosted, and finished third. This is the match neither of the two teams wanted to play but really have no other choice. Doesn’t it make you wonder who wins the Third-Place Match at the World Cup? The team that’s the least disheartened? Or the team that most feels they have one last thing to prove? A neat bit of trivia: the third-place match is the one World Cup match that has never come down to a penalty shootout and went into extra time only once in the World Cup’s history. Whatever the situation, the two semifinal losers will duke it out for one last World Cup shot in the Estádio Nacional Mané Garrincha. I don’t think very many people make predictions for the third-place match. Maybe they do. Whatever the situation, I thin I’ll make a prediction for Saturday’s game. First a rundown of the two teams. Starting with past head-to-head results. Past Head-To-Head Results: Netherlands and Brazil have squared off eleven times before: Netherlands won three, Brazil three and five draws and both teams have scored a total of 15 goals against each other. The World Cup has been the stage for four of those previous rivalries. First was in 1974 during second-round group play which the Netherlands won 2-0. Second time was in the 1994 quarterfinals where Brazil was the victor that time 3-2. Third time was the following World Cup in the semifinals where they tied 1-1 only for Brazil to win in a penalty shoot out. Fourth time was at the last World Cup in the quarterfinals where Brazil pretty much gave it away with an own-goal and Oranje won 2-1. So what does the fifth World Cup rivalry look like? NETHERLANDS: Here’s a team that’s struggling to get their first World Cup win. Three times the bridesmaid (1974, 1978 and 2010), never the bride. Here in 2014, they were brilliant in the group stage winning all their games and humiliating defending champions Spain 5-1. They continued to look good with their 2-1 win over Mexico in the Round of 16. However there was a sign they would struggle when they played to a scoreless draw against Costa Rica in the quarterfinals. Hey, don’t underestimate Costa Rica’s defense. Fortunately their replacement goalkeeper Tim Krul was the right choice as he blocked two Costa Rican penalty kicks to help Netherlands advance to the semifinals. Then their semifinal against Argentina. Netherlands had slightly more ball possession while Argentina had five attempts on target compared to three from the Dutch. Nevertheless it was awfully bleak for a game like that. The two were just tough rivals. So after 120 scoreless minutes, it took penalty kicks to decide. This time head goalkeeper Cillessen was kept in. However the penalty kicks from Ron Vlaar and Wesley Sneijder were no match for Argentina’s Sergio Romero. It only took a four in a row from Argentina to take them to the final. 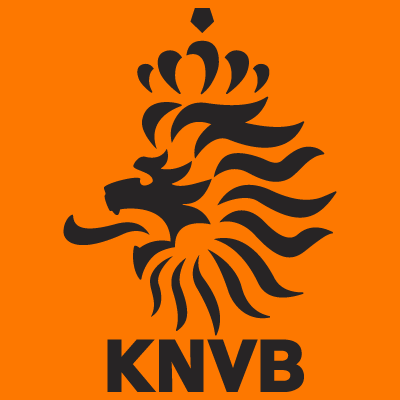 So now that the Dutch are out of contention for the Cup, will they win this match? They have played one third-place match before back in 1998 to Croatia and lost 2-1. They have shown in plays against Argentina and Costa Rica that they can control the ball and they can control their opponents, even when they don’t score. They showed in their 5-1 win against Spain they can really seize the moment and challenge a top rival. However the fact they haven’t scored a goal since the Round of 16 really makes me question if the ‘Orange Magic’ has faded. Also who knows how hungry Brazil is? And I’ll get to them later. If they want to win, they should maintain the same control they had during the field play time they had. Also Cillessen should be on guard. Until the penalty shoot out against Argentina, he has only conceded four goals this World Cup. Natherlands has the ability but do they have the hunger? BRAZIL: To be honest, there were actually bigger humiliations at this World Cup than Tuesday’s Mineirazo. Like defending champs Spain losing 5-1 to the Netherlands and then 2-0 to Chile to be out of the running. Or how about England failing to win a game for the first time since 1958? Even Italy being ousted in Group Stage for the second World Cup in a row is a pretty big embarrassment. Nevertheless Tuesday’s 7-1 loss to Germany right in front of a home crowd as World Cup host nation really bruised the nation’s football ego. A nation that had the biggest World Cup legacy had their current teams weaknesses exposed by Germany on a home stage and in front of the eyes of the World. And they still have to fight one last time. No doubt this was a team that was showing signs of struggle. Coach Scolari knew the difficulties he had to deal with and team psychologist Regina Brandao really had to work with the team. The setbacks of Neymar getting his back broken and Thiago Silva being banned from the semifinal match was sure to almost everybody this would set Brazil back, but nobody expected a disaster like this. Now that the third-place match is ahead, there may be question if Brazil will be ready physically. Neymar of course won’t be there. Thiago Silva can be eligible to play again which should be crucial as he was critical to their defense. Also the question if Fred will be on the roster especially after his bad play during the game. Also there is the big question of whether Brazil will be there for the game mentally. You can bet that between Tuesday and Saturday, Brandao will have to work better than she ever has. Of all current players on Brazil’s team, it’s probably Julio Cesar that would probably be the one most hurt mentally. He’s the one that let those seven goals in. There have been big-name athletes and teams that would have to perform right after a humiliating performance. Some would be the all-or-nothing type and deliver half-heartedly and then there are some that would deliver for pride and come out shining despite losing it all. That’s what it would come down to with Brazil’s play on Saturday. Brazil has played three third-place matches in past World Cups and won two but this is a different third-place match for the team. We know how hurt they are but how will they deliver on their last shot for glory? Update (11 July): Actually I did some thinking in the past 24 hours and even did some reading. And I didn’t let statistics get in the way, even though World Cup host nations have played the third-place match four times before and won three times. Actually I based my opinion on team attitude. That is a critical factor for the third-place match. And my new prediction is Brazil 2-1. The Netherlands lacks motivation. Coach Louis Van Gaal sees the game as pointless, Wesley Sneijders said the only match that matters is the one for the Cup and Arjen Robben has appeared equally disinterested. However the Brazilians are very motivated for this match. And rightly so. Scolari has encouraged the team to play the match out for pride and the honor of the Brazilian team. I’m sure after the embarrassment on Tuesday, that is the motivation they will need. Even the teammates agree, and Thiago Silva is eligible to play again. Go Brasil! Brazil 2014 hoped to make the 1950 World Cup final a thing of the past. Instead it created a new bad memory of a nightmarish 7-1 loss to Germany in Tuesday’s semifinal. It was to be another proving point for Brazil. They made it to the semifinals. It was a long three weeks. The team known as the Seleciao had moments of glory like their opening 3-1 win over Croatia and 4-1 win over Cameroon. However they have shown their vulnerability with a 0-0 draw against Mexico and a 1-1 draw against Chile where they advanced by winning the penalty kicks. Their previous game, the quarterfinal against Colombia, was another win for them: 2-1. However despite the win, there was concern as Thiago Silva, their top defender, was given a yellow card penalty which would prevent him from playing in the semifinal. Not to mention the sudden back injury to Neymar Jr. There was talk. Will Brazil win? Can they compensate from their sudden losses? There were many that were doubtful and predicted the win to go to Germany. There were some that were optimistic like Ronaldo and coach Luiz Felipe Scolari. They still felt like Brazil had very good chances. So the stage was set. Brazil was to play their semifinal against Germany at the Mineirao in Belo Horizonte. Just ten days earlier, they played Chile in their Round of 16 match in that same stadium. Just five days earlier, an underpass in Belo Horizonte specially created as part of a highway upgrade for the World Cup collapsed killing two and injuring 23. The game began as expected with the two teams being led onto the field by Brazilian schoolchildren. The national anthems were played with the whole stadium engulfed in singing Hino Nacional Brasileiro. The team also gave a special tribute to Neymar who was still being treated for his fractured vertebrae. Images of Brazil’s heartbreak: (from top) young woman, young boy, and a distraught David Luiz. Then the kickoff happened. Play went as it normally did with Brazil having much control of the ball with the occasional steal from Germany. Then in the 11th minute, Germany had a chance to score via a corner kick from Toni Kroos. Thomas Mueller gave a header into the Brazilian net. Germany drew first blood 1-0. The opposing team drawing first was something Brazil was familiar with and has won matches before with that start. Then in the 23rd minute, and attempt at a goal was sent by Germany and Brazilian goalkeeper Julio Cesar tried to stop it, only to have it bounce off him and be in a clear path for Miroslav Klose to score the second goal of the match and a World Cup record 16th goal of his career. Ironically the old record holder Ronaldo was in the stand watching. It was obvious something was wrong and the crowd was already silent but what would soon come would be like a nightmare to the Brazilian’s eyes. Just as things were about to settle again, the ball was immediately stolen by Germany and Toni Kroos scored another goal one minute after Klose. Then two minutes later, another goal from Kroos! And both from one-touch shots. 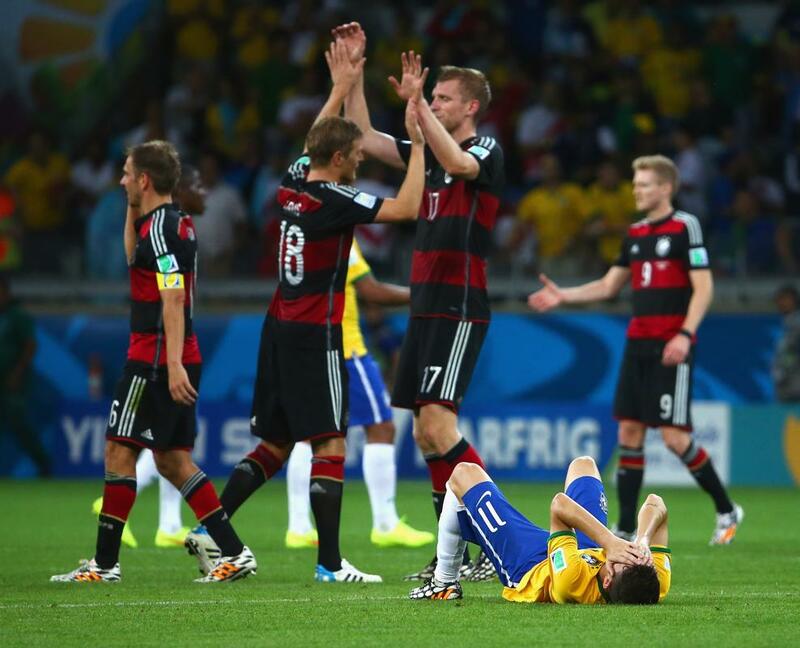 Everyone from Germans to broken-hearted Brazilians were stunned. Then just as the game looked like it would settle down soon, along came Sami Khedira in the 29th minute and scored goal #5. No doubt it was all over by then. It would take a major miracle for Brazil to win this game. Fifteen minutes would pass with the ball being shifted possession to Brazil and then to Germany. You could tell by the look on their face and the errors the Brazilians were causing that the team was panicking. Then the half-time whistle blew. It was obvious Brazil was going to lose. Heartbroken fans were already leaving the stadium. The first minute of the second half came with substitutions for both teams. Germany only substituted one player but Brazil substituted two: Hulk and Fernandinho for Paulinho and Ramires. Later on Brazil, obviously desperate to redeem itself, gave many good attacks and attempts on goals but they either missed or were saved by German goalkeeper Manuel Neuer. At the 58th minute, Germany substituted Miroslav Klose with Andre Schuerrle. However it was only eleven minutes later when Schuerrle gave a tap-in to the Brazilian net to make the score 6-0. Several more desperate attempts to score from Brazil came but to no avail. Brazil even substituted Fred, who many described as giving the worst performance in World Cup history, for Willian at the 70th minute. Fred was given a hostile reaction from the fans as he walked off. Then right at the 79th minute, it was Schuerrle again and he gave a half-volley to beat Julio Cesar at the near-post to make it goal #7. And just when you think Germany’s given them enough, Mesut Oezil gives an attempt for goal #8 but his effort goes off wide. Then almost immediately after, Brazilian Oscar scores Brazil’s one and only goal at the 90th minute. But there was no celebrating from Oscar and very little cheer from the crowd. Even a television announcer described it as possibly the least celebrated home team goal in World Cup history. Then Mexican referee Marco Rodriguez blew the final whistle. 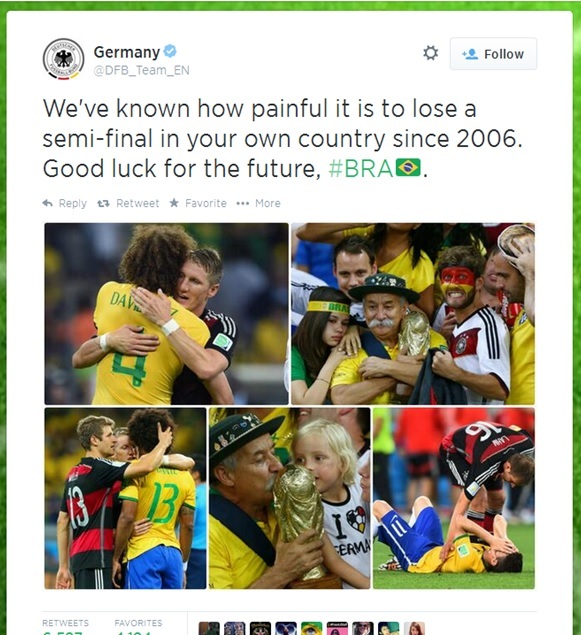 The score was official: Brazil 1 – Germany 7. Germany was going to the final for the Cup for a record-setting eighth time. Brazil however was just dazed and confused with what happened. Some were in tears. Some just lay on the field in humiliation and some even prayed. Some Brazilian fans booed the Brazilian team and gave them the thumbs down. Germany celebrated but kept its celebration modest. Then many German players went to the distraught players, consoled them and gave them comfort since they knew it was a moment of heartbreak for the Brazilians. That was probably the best display of sportsmanship at this World Cup and it was great to see since this World Cup had been plagued with a lot of unsportsmanlike behavior. That game was unbelievable to say the least. Usually for a 7-1 result to happen at a World Cup game, it would be in a Group Stage match and usually between a strong team and lesser team. But 7-1 in a semifinal? And between the two countries with the biggest World Cup legacies? Even when I saw it at the Vancouver Alpen Club, I went from cheering the first goal to doubting what I saw after the second goal to having complete disbelief goal after goal. I’m sure there were lots of other Germany fans that were stunned silent like me. Brazil’s biggest loss ever in a World Cup match. Biggest loss of any World Cup host nation. Most lopsided semifinal in World Cup history. Tied with a 6-0 defeat to Uruguay in 1920 for the biggest defeat of the Brazilian national team. Brazilian national team’s first loss on home soil since 1975. As you can see six host nations have won the Cup. However three have hosted a second time and didn’t win: Italy and Germany both finished 3rd in their second hosting and France lost their quarterfinal 60 years before winning as hosts. South Africa had the misfortune not just to simply lose out in the Group Stage but became the first country in World Cup history to do so. Until then, every host nation advanced past the first round. 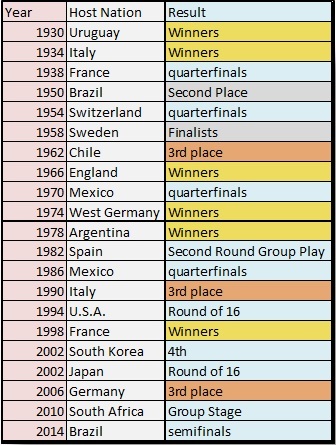 There have been a lot of cases where even amongst host nations that didn’t win the Cup, they would have their best ever World Cup result such as Sweden being finalists, Chile finishing 3rd, South Korea finishing 4th and Mexico making the quarterfinals on both occasions. Actually until 1994, those were the only two times Mexico advanced past the Group Stage. However there have been cases before where host nations failed to live up to par like France in 1938 and Switzerland in 1954. Spain is another example. They were hoping being host in 1982 would break their reputation as being football’s greatest underachievers. Instead it saw them being ousted in the second round of group play. However there were many times when even in defeat, it would mark a turnaround for the country’s football team. France became a better team after their 1938 humiliation, Brazil won five World Cups after the Maracanazo, Mexico has advanced past the Group Stage every year since hosting the second time in 1986, the U.S.A. has gone from being a joke in the football world to a major contender since 1994, Japan has seen football grow since hosting and Spain became World champions in 2010. There’s no doubt that Brazil had a lot of pressure going into the game. Heck, there was a lot of pressure on the players even before the 23-man team was decided. It got to the point head coach Luiz Felipe Scolari brought in team psychologist Regina Brandao to assess the psychological profile of 50 players for Scolari to decide the cut. However pressure was so tense during the Round of 16 match against Chile which Brazil won after penalty kicks, sever players cried prior to the shoot-out. Scolari called Brandao in immediately after to try and ease the situation before the quarterfinal against Colombia, in which they won 2-1. Nevertheless the absence of Thiago Silva because of his accumulation of yellow cards was going to affect Brazil’s defense and they knew it. Neymar being hospitalized with a fractured vertebrae during the match was another blow. Nevertheless it appeared things might not hurt Brazil so much as they continued to play consistently without them. However that was one match and the semifinal was another. The Brazilian team appeared confident at the start but it soon became evident that something was amiss. However it was evident after Germany’s four-goal streak in six minutes that something was direly wrong. Brazil just didn’t look like Brazil anymore. You could tell the sense of panic in the faces of the players and even in some of the blunders. The goal saving by Manuel Neuer made things even more frustrating especially since Brazil delivered some great chances. Overall Brazil was better than Germany in many other statistics: 52% ball possession, 18 shots taken compared to Germany’s 14, two more corner kicks and three less fouls committed. The shots on target statistic may not look like a big deal–ten for Germany and eight for Brazil– but the final score showed that Brazil definitely had their weaknesses exposed in front of the world and on home turf. Even thinking back to their past games and the glitches they had there, I sometimes think that the loss was a collapse waiting to happen. You may remember from my blog on 1950 how heartbroken Brazil was to the point some committed suicide. I haven’t heard of any news of suicides yet. Nevertheless reactions have been mixed. There were definitely a lot of people crying. There were also a lot of angry people: some even going as far as calling Brazil ‘losers.’ A lot of negative tweets on Twitter. There was even flag-burning in Sao Paulo and a robbery at a party in Rio de Janeiro. Some even chanted obscenities at President Rousseff during the game. The media is also questioning whether she will be re-elected in the upcoming election this year. As for the media, Brazilian newspapers gave front page titles like The Disgrace Of All Disgraces, The Biggest Shame In History and Historical Humiliation. Just like the 1950 loss has since been called the Maracanazo, this game is starting to be called the Mineirazo. Oh yeah, it’s interesting to note that the German team had to be escorted out of the stadium by police. Also it was worth noting that former Brazilian player Cafu was denied access to the Brazilian dressing room, even though he went there to give words of comfort to the team. As for Brazil, this will remain a big question of how things go. No doubt the team is hurt and no doubt the nation is broken-hearted. Coach Scolari has accepted the blame for what happened. The players have their own feelings. However it’s not over for Brazil yet. There is still the third-place match against the Netherlands in Brasilia the day before the World Cup match will be played. Brazil could go out there and lose again. Or they could go out there and play for pride. 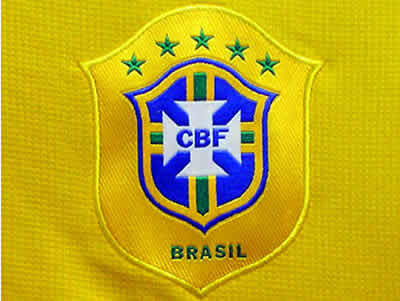 Also I think if the fans truly love the Selecao, they’d gladly cheer them on during the third-place match. Heck, I saw fan passion from fans of Spain during their game against Australia even though they knew Spain was out of it. As for the status of football in Brazil, I don’t think this match will hurt it. Brazil has a proud legacy of producing some of the finest talents and frequently creating winning teams. I’m sure that boys and girls across Brazil will still dream of playing for the national team and winning the World Cup. A defeat like that should not crush their dreams. As for reactions as devastating as what happened in 1950, we’ll have to wait and see. I just received word from my uncle that 250 people in Brazil were killed in football-related riots. Hopefully nothing tragic happens in the aftermath of this match. Also I look back at how the white uniforms in 1950 were considered bad luck. After this, will holding the World Cup in Brazil be seen as bad luck? Isn’t it something how Spain’s early ouster inspired me to look at being defending champion more closely. Now it’s Brazil’s big loss to Germany that has me looking at the pressures of being the host team. Two unique pressures, both having its own weight and both being make-or-break. No wonder winning the World Cup is such a marathon full of drama. The World Cup in 1950 was to be Brazil’s shining moment. Instead it delivered a heartbreak that still haunts them to this day. You may remember a while back I talked about Brazil’s football legacy but refrained from talking about 1950, the first time they hosted. The first time they hosted was intended to be a grand moment for the country and especially their football team. In fact the Maracana was built to be the grand stage for Brazil’s win. Unfortunately the Cup ended with a heartache that still haunts the country to this day. 1950 was to be the fourth time the FIFA World Cup would be held. It started in 1930 but the 1942 World Cup had to be cancelled because of World War II. The 1946 World Cup was also cancelled as the world was still recovering from the end of that war just one year earlier. Just like 1948 was the year that brought the Olympic Games back to life, 1950 was the year the World Cup came back. However Germany and Japan were still part of the international sanctioned list and were banned from competing, just like they were banned from the 1948 Olympic Games. Brazil and Italy were given automatic berths: Brazil as host country and Italy as defending champions. The four British nations of England, Scotland, Wales and Northern Ireland returned to FIFA after seventeen years of ‘exiling’ themselves. 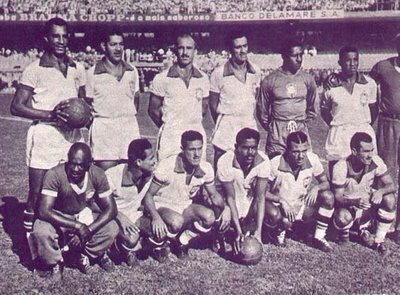 The 1950 Brazil team. Before 1950, Brazil’s best finish at the World Cup was third in 1938. Seven spots were allocated to European countries, six to American countries and one to an Asian country. If you think it’s hectic getting teams to qualify for the World Cup, you should hear about 1950. Not because of competitive play but more because of international politics and football politics. Iron curtain countries like the USSR and two countries that participated in 1938–Hungary and finalist Czechoslovakia– refused to participate. Argentina, Peru and Ecuador withdrew after the qualifying round, possibly because of a dispute with the Brazilian Football Federation. The Philippines, Burma and Indonesia withdrew leaving India to receive the Asian berth by default. Austria declined to participate in qualifying feeling its team wasn’t good enough and Belgium withdrew from the qualification tournament which allowed Switzerland and Turkey to qualify without playing their final round of matches. With the qualification done, it was off to the World Cup, right? Scotland withdrew because the very prideful chairman of the Scottish Football Federation insisted Scotland would only travel to Brazil as winners of the Home Championship. When England showed up, Scotland withdrew, even though England planned to attend even without the Championship. Turkey withdrew because of the huge cost of traveling to Brazil. FIFA invited two European nations who failed in qualifying–Portugal and France–to fill the gap. Only France accepted. After all that hassle, the World Cup finally began on June 24, 1950. This would be the first world Cup since the inaugural 1930 World Cup where group play would be contested and would be the only World Cup where group play would decide the winner. It was Brazil’s idea to do this because more games meant more ticket sales to help compensate for the expenses of the stadiums. FIFA at first rejected the idea but agreed when Brazil threatened to pull out as hosts. The matches were held in six stadiums in six cities: Rio De Janeiro, Sao Paulo, Belo Horizonte, Curitiba, Porto Alegre and Recife. Four of the six stadiums were long into existence before the World Cup. There were only two that were build especially for the Cup: Estadio Raimundo Sampaio in Belo Horizonte and the Maracana in Rio. Because of the uneven number of teams per group, it was decided that only the team that finished first advances. Group 4 had no problem deciding the advancer as that only required a single game, which Uruguay won 8-0 over Bolivia. In Group 3, Sweden was the winner with a win against Italy 3-2 and a draw against Paraguay 2-2. Groups 1 and 2 were the two fully contested groups and they provided the most action. Group 1 was a no-brainer right from the start. Brazil delivered an attack style of play that would take them to the top of the group with a 4-0 win over Mexico, a 2-2 tie against Switzerland and a 2-0 win over Yugoslavia. World Cup 1950 wasn’t all Brazil, Brazil. It also was the stage for the American’s 1-0 upset over England with Joe Gaetjens (right) scoring the winning goal. Group 2 was not exactly remembered for its winner Spain or for Spain’s wins of 3-1 over the US, 2-0 over Chile or 1-0 over England. Instead Group 2 was known for one of the biggest soccer upsets of the time. The US vs. England match first appeared to be England’s for the taking since England, known then as the ‘Kings of Football,’ had the pros on their team while the American team was made up of part-time players who made their income from the jobs they worked. 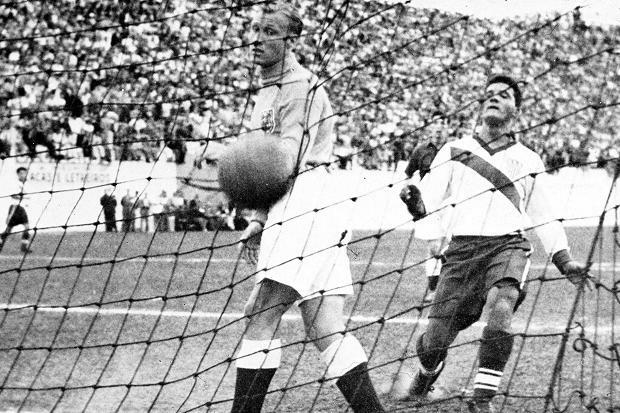 However the English and the 13,000 in attendance at the Estacio Independencia in Belo Horizonte were stunned when American Joseph Gaetjens, who was actually not an American citizen, scored the first goal in the 38th minute. Despite strong challenging play from both sides throughout the game, there were no other goals scored. The Americans’ 1-0 win over the English is still considered one of the biggest upsets in World Cup history. ANOTHER SET OF GROUP PLAY? Because of the uneven numbers of the groups in the first round, it was not only decided that only those that finish first in their group advance but also that it be group-style play to decide the winner.Also that ticket sales thing also has a lot to do with it too. This would be the only time in World Cup history in which group play would decide the winner. In group order, the finalists were Brazil, Spain, Sweden and Uruguay. All of the games in the ‘winners group’ were played either in Sao Paulo’s Estadio de Pacaembu or the Maracana. All teams played all their matches on the same day and at the same time. Brazil’s matches in this round were all contested at the Maracana. The group play of the winners started July 9th with a 2-2 draw between Uruguay and Spain. Brazil delighted a crowd of 139,000 with a 7-1 win against Sweden which included four goals from Ademir. On July 13th Brazil continued their winning ways in front of a crowd of 153,000 with a 6-1 victory over Spain which included the Cup’s only ‘own goal’ by Spaniard Jose Parra Martinez. Uruguay gained some boost with a 3-2 win over Sweden with the winning goal coming with five minutes to go. The two games on July 16th were still group games however many still believed they played the role as 3rd Place Final and Final because of the end result and the team’s overall placing. Sweden beat Spain 3-1 in Pacaembu with a measly attendance of 11,000 and would finish the World Cup in third place. Okay, here it was. This was Brazil’s for the winning. They were in excellent position to win the World Cup. They’ve already proven to the world their greatness. Even if Brazil tied Uruguay, they could still win the World Cup because Brazil had two wins while Uruguay had a win and a tie. The general public were not the only ones claiming Brazil to be the victors days before the match even started. The specialized press were too. In fact the Brazilian newspaper O Mundo printed an early edition paper that day with the Brazilian team on the front page with the headline ‘These are the World champions.” There was a song composed days before the game entitled Brasil os vencedores (Brazil The Victors) and was to be played once Brazil won. Even Julie Rimet, president of FIFA and founder of the World Cup, anticipated Brazil would win and even had prepared a speech in Portuguese to congratulate anticipated winners Brazil after their win. Unlike now, medals were not awarded to teams at the World Cup who finished in the Top 3 but the Brazilian Football Confederation has already made 22 gold medals with the names of the players engraved on them. On the morning of July 16th, the streets were already full of energy and there was even a ‘makeshift carnival’ with thousands of signs celebrating the world title and chants of ‘Brazil must win!” The Maracana was bustling in its own way. One thing we should remember is that the Maracana stadium consisted of two tiers of stands and much of the stands were standing area. This is the reason why unlike today they could field a capacity of over 100,000. At this match, the official paid attendance registered 173,380 attended while many estimate the actual attendance was over 210,000. This still remains as a world record for attendance for a team sports match. The goal scored by Alcides Ghiggia (centre) in the 79th minutes stunned the Maracana silent and would break the hearts of Brazil. As expected, the game began with Brazil playing aggressively and attacking against the majority of the Uruguayan defensive line for the first half. However unlike Spain and Sweden, Uruguay was successful in maintaining their defense and the first half ended scoreless. Uruguay was able to find control of the game and Brazil soon had its defensive frailty exposed. Juan Alberto Schiaffino scored the equalizer for Uruguay in the 66th minute. 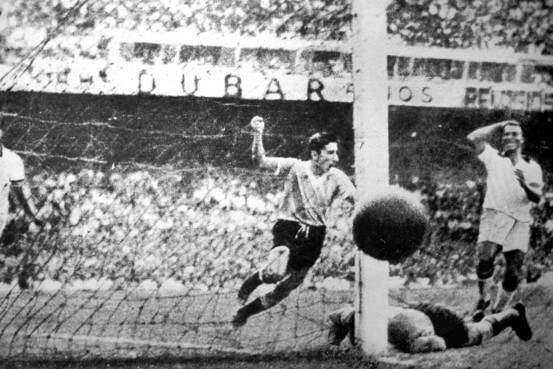 Then in the 79th minute, Alcides Ghiggia ran down the right side of the field, dribbled past Brazilian defender Bigode and scored another goal. The crowd was virtually silenced; Uruguay was now the leader. The silence continued for the remainder of the play until Reader blew the final whistle. It was official: Uruguay won the Cup by defeating Brazil 2-1. In the years to come, the game was influential for a lot of superstition. For one thing, Brazil refused to have a white-and-blue uniform and would soon adopt their famous yellow shirt with blue collar that still exists today. White is seen as bad luck in Brazil. The players of the time were vilified by the fans and were sometimes seen as bad luck. Many went into silent retirement while some never played for the national team again. Only two players that didn’t play in the final played for Brazil’s team in later World Cups. The defeat would weigh down on Brazil’s team so much, they brought a psychiatrist to the 1958 World Cup to remove the haunts of the memories of that game. Whatever the situation, the Brazilian team of 1958 which featured a 17 year-old Pele capturing the world’s imagination won the World Cup: the first of five total World Cups won by Brazil. Brazilian goalkeeper Moacir Barbosa would be blamed and even vilified for Brazil’s loss for the rest of his life. However of all the players from Brazil, it was goalkeeper Moacir Barbosa that got hit the hardest. He received the biggest flack and biggest blame for the Maracanazo and it seems like Brazil never forgave him. 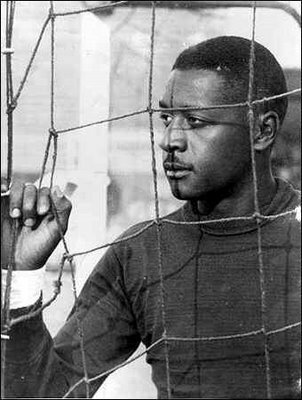 He was still able to play professionally for another thirteen years and was even part of Brazil’s national team until 1953 but he was commonly shunned by the nation. There was even one time he was in a store in Brazil and a mother pointed at him and said to her small son: “Look at him, son. He is the man who made all of Brazil cry.” Little changed over the years. In 1993 the president of the Brazilian Football Confederation refused to let him be a commentator. In 1994, the Brazilian national team did not want him to visit them because they feared he would give them bad luck. If there was one good thing, his wife stayed married to him for a total of 50 years until her death in 1997. He managed administration at the Maracana but was always at a shortage for money after leaving. He did however received assistance from sources such as Brazilian football team Vasco da Gama and his wife’s friend after her death. The friend remembered his last years: “He even cried on my shoulder. Until the end he used to always say: ‘I’m not guilty. There were 11 of us. '” Moacir Barbosa died of a heart attack in 2000 at the age of 79. He was penniless at the time. One interesting note is what happened to Alcides Ghiggia who scored that heartstopping goal. He would continue to have a prolific career as a professional player until 1968 and was even signed onto European teams like AC Milan and AS Roma during a time when it was extremely rare for South American players to play for teams outside their home country. As of today, the 87 year-old Ghiggia is the only surviving member of Uruguay’s World Cup winning team from 1950. The Brazilian team this year are hoping to finally make that bad memory of 1950 a think of the past. So far Brazil have been doing very well even if they’re not the most spectacular team out there. They opened with a 3-1 win over Croatia but left people shocked with a 0-0 draw against Mexico. They did reassure people that they will win with a 4-1 win over Cameroon to close out the Group Stage. They did win the Round of 16 match against Chile on penalty kicks after a 1-1 draw. For those concerned since that, don’t be. There have been many teams in the last 28 years that had a match lead to penalty kicks before they played in the final for the Cup and won. Brazil has a football legacy like no other nation and its legendary player Pele is commonly regarded as the epitome of its greatness. We all love Brazilian football because at its best, Brazilian football is the paradigm of how we want football to be played. We want it musical, we want amazing skills but we want the kind of friendship and the teamwork also beautifully mixed and working together. Remember back when I did my blog on Russia’s Winter Olympic Legacy I mentioned my naive belief as a kid that if a country had a big sporting legacy, they deserved to host an Olympics? Anyways I would also have that naive belief for hosting the World Cup too. It’s not that embarrassing since every country that’s won the World Cup has hosted in the past. If I thought that now, it would be kind of embarrassing because of how expensive it is. Whatever the situation, you can’t deny Brazil’s legacy. So the question is how did a British sport like football become almost religion-like in Brazil? Well there are some beliefs but no real conclusion on who first introduced it. Some believe it was introduced to Brazil by a Scottish expatriate by the name of Thomas Donohue. In fact the first ever football match contested in Brazil was played in a pitch marked out by Donohue near his workplace in Bangu back in April, 1894. Some believe it was introduced to Brazil by Charles William Miller, son of John Miller who worked on a railway construction project in Sao Paulo in the 1870’s. Charles not only learned football while studying in Southhampton but when he return home from his studies in 1892, he brought with him some football equipment and a rule book. He introduced it through the Sao Paulo Athletic Club. Miller was a great coach to the team and he was even able to get two English teams to play against the Athletic Club and other teams in Sao Paulo. You could say the rest is history. Eventually Brazil would get its own national football federation–the Brazilian Football Federation–on June 8, 1914 and their first international match was a match between a team combined team from a club from Rio and a club from Sao Paulo against English club Exeter City shortly thereafter. Those who are into World Cup trivia may know that Brazil has been in every World Cup since it started in 1930. It’s not to say that they began with a bang. In fact the BFF was not the best at organizing national teams for quite a while. In 1930, organizing national teams was a relatively new idea at the time so you can imagine getting a team for the very first World Cup would be through the same thought process today. In fact only thirteen countries, including Brazil, though the inaugural World Cup was worth competing in. Back at the first World Cup, there was only one group of four teams and three groups of three teams. Brazil faced Yugoslavia and Bolivia in their group. They lost to Yugoslavia 2-1 and won against Bolivia 4-0. Despite finishing second, they did not advance as only the #1 team from each group advanced and Yugoslavia finished #1. Their next World Cup, Italy in 1934, was also lackluster as the whole tournament was a last-team standing competition–no First Round group play at all–and Brazil lost its opening match: against Spain 3-1. That ended their World Cup run fast. 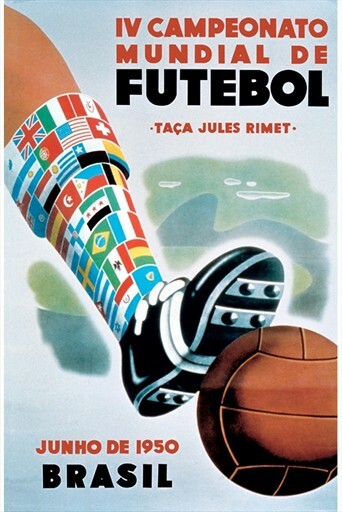 However things were really starting to look up for Brazil in France in 1938. Their team was much better and it featured the legendary Leonidas. As in 1934, it was a last-team-standing format from start to finish. Brazil won its opening match against Poland 6-5 with Leonidas scoring a hat-trick and won its quarterfinal against Czechoslovakia. Actually they needed a second quarterfinal to play as they tied the first 1-1. Brazil won the second 2-1. However they were stopped in the semifinals by eventual winner Italy 2-1. Brazil did win the third place match against Sweden 4-2 and Leonidas was the top scorer with 7 goals. Too bad the Golden Foot award wasn’t awarded back then. Brazil hosted in 1950. I’ll actually save that competition for another blog as I will tell about the infamous Maracanazo and the crazy aftermath that happened since. Few players from 1950 returned in 1954. Brazil was ousted in the quarterfinals by Hungary 4-2. The era from 1958 to 1970 has to be Brazil’s most treasured because that was when the Brazilian national team was at its best and enchated the world. It all started in 1958 when coach Vicente Feola coached the team and even gave them a list of forty things not to do including smoke in front of journalists. They even brought a psychiatrist to the team. Whatever the situation, Brazil was brilliant in group play with two wins and a draw, winning their quarterfinal against Wales 1-0, their semi against France 5-2 and then winning their final against hosts Sweden 5-2. The top goalscorer may have been Just Fontaine but it was the second-highest scorer–a 17 year-old Brazilian named Pele–that captured the imagination of the world. Even in the group stage, he dazzled crowds with his flare and his goal-scoring ability. Another key note is that Pele wore the number 10 at that World Cup it’s been since common trait that most national teams designate the number 10 to their best players. Pele however won the FIFA Silver Ball award for being the second-best overall player at the World Cup. The winner of the Golden Ball was another Brazilian, Didi, who actually scored a single goal but delivered the best midfield efforts of the tournament. Pele’s fame grew as did his football playing prowess and the whole Brazilian team garnered fame with him. In Chile in 1962, Pele was back and expected to star again. He did score in the first game but was sidelined with an injury during the second game. That would cause him to miss the rest of the tournament. Nevertheless Brazil performed well as his replacement Amarildo scored three goals and two players, Garrincha and Vava, scored four goals each. Garrincha was considered to be the top player of the tournament. The team also did a noble thing after defeating hosts Chile in the semifinals. They carried the Chilean flag out on the field. In England in 1966, it appeared success was starting to get to Brazil. They began well with a 2-0 win against Bulgaria that included a goal each by stars Pele and Garrincha but it was all downhill after that with 3-1 losses against Hungary and Portugal. That left Brazil 3rd in the group and out of the tournament: the second of five instances when the defending World Cup champion failed to advance past the Group Stage. Then came Mexico in 1970. Mario Zagallo, who played for Brazil during its World Cup wins in 1958 and 1962, was assigned coach by the president of Brazil. The president also demanded that many players including the aging Pele be put on the team. Pele first seemed uncomfortable with his role but things changed once the contest started. Brazil won all their Group Stage matches, won their quarterfinal against Peru 4-2, their semifinal against Uruguay 3-1 and then their final against Italy 4-1. 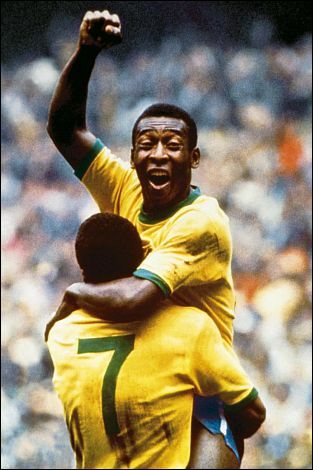 Jairzinho was the top goalscorer of the team with 7 goals but it was Pele who won the Golden Ball award for being the best overall player with a performance that included four goals. And to think Pele thought at the beginning he wasn’t good enough for the team. Pele also won the FIFA fair play trophy for not receiving a single yellow or red card. Pele also has the distinction of being the only player to play for three World Cup winning teams. Zagallo made history by becoming the first ever to win the World Cup both as a player and as a coach. Germany’s Franz Beckenbauer is the only other one to do so. 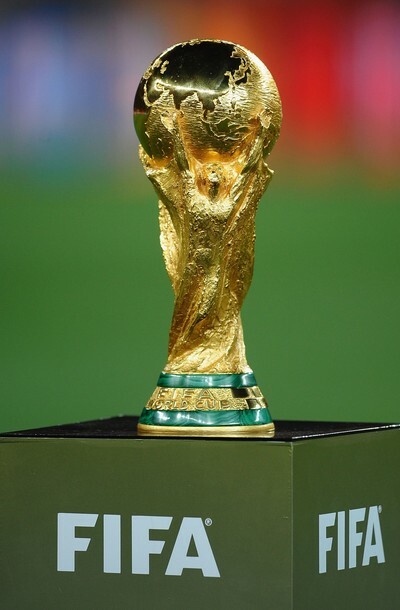 On top of that Brazil was given the distinction of being allowed to keep the Jules Rimet trophy for winning the World Cup three times. The 1970 team for Brazil is still considered by many to be the best team ever in World Cup history. The odd irony is that it was only a matter of months until the Jules Rimet trophy was stolen. It was never found. After 1970, Pele was no longer part of Brazil’s national team and there was a brand new World Cup trophy that made its debut in 1974 and is the current trophy today. It seems like those marked the end of Brazil’s magic at the time because Brazil would struggle to regain its winning sense. 1974 and 1978 World Cups consisted of not only group play for the opening round but also for a second round for the eight that qualified. The top teams at the end of the second round of Group Play played in the final for the Cup, the second-place teams played for third place and the other four teams headed straight home. In both cases, Brazil came second. Brazil again found itself out of the competition because of second round group play in Spain in 1982. In 1986 started the current format of Group Play and the last-team-standing format that started with a Round of 16. Whatever the situation, Brazil was brilliant in Group Play wining all their games and even winning their Round of 16 game against Poland but drew 1-1 to France in the quarterfinals and then lost the penalty kicks round. 1990 added further insult as Brazil again won all three of their group play games but fell to Argentina 1-0 in the Round of 16. It was a question to many of why. Was it the format of play? Was it the change of system where Brazilian players were now mostly playing in Europe instead of playing with Brazilian clubs as was the case in Pele’s day? It’s still a wonder. These past twenty years have actually seen a resurgence of Brazil’s greatness and even write a new legacy for them. It first started at the 1994 World Cup. This time they came packed with stars like Romario, Bebeto, Taffarel, Dunga and Jorginho. The group were very good, if unspectacular, being very solid in the rounds leading up to the final. The final was a classic rematch against Italy. The game was an unspectacular 0-0 which led to a penalty kicks contest. Brazil won 4-3 and became the first country to win the World Cup four times. 1998 saw the emergence of another young Brazilian with the potential to become a great, Ronaldo. He and the Brazilian team were very good leading up to the final but it was the home country French team that really caught the world’s attention at that World Cup. France has commonly been known as Brazil’s ‘achilles heel’ and they gave Brazil their loss 3-0. Under the guidance of coach Luis Felipe Scolari, Brazil came back in 2002 with the help of the three R’s–Ronaldo, Rivaldo and Ronaldinho– and won the World Cup without a loss. Ronaldo won the Golden Boot award for his scoring of eight goals, the most goals scored in a single World Cup since 1970. Brazil has continued to maintain a record of consistency since the 2002 World Cup and has continued to produce new stars. Even manager Carlos Alberto Ferreira formed a playing system known as the ‘magic square’ that proved very successful in competitions leading up to the Cup. The ‘square’ appeared to work well in the first rounds of the 2006 World Cup despite the underperforming of star Ronaldinho at the time but they fell in the quarterfinals to their traditional top rival France 1-0. To the surprise of most, Brazil was out in the quarterfinals. Brazil continued to be favored leading up to the 2010 World Cup and even won their ‘group of death’ albeit unspectacularly but fell again in the quarterfinals. This time to the Netherlands 2-1. Further disappointment came at the 2011 Copa America when Brazil lost in the quarterfinals but a major upper came when they won the Confederations Cup against World Cup winners Spain 3-0. Here at this World Cup, Brazil tried to attempt the one football feat they don’t own: winning the World Cup on home soil. They brought Luis Felipe Scolari back to help them win it. They’re also relying heavily on the young great Neymar who has already scored two goals in World Cup play. The remaining three weeks will decide. Brazil has had a football legacy and it has had its downsides too. You can understand why a country this passionate about football believes that a win of the World Cup is the only acceptable result. You can understand the pressure that the current Brazilian faces leading into this World Cup. You can also understand why a country like Brazil has won more World Cups than any other country and continued to churn out legend after legend. It’s no wonder no country has delivered more football magic than Brazil. As for predictions for the knockout rounds, I’ll wait until the qualifiers are decided. Meanwhile I will give a prediction for the final for those curious: Brazil vs. Argentina which Brazil wins. Let’s see if it hold up. Anyways enough of predictions! On with my blog! The 2014 World Cup opened on June 12th with a spectacular opening ceremony at 3pm in the newly built Arena de Sao Paulo. The competition started with the opening game of hosts Brazil vs. Croatia. Each team by now has played at least one match to get things rolling. Even in the months and years leading to the competition, the World Cup made headlines and continues to make headlines now for all the activity on the field and off. Football is a matter of life and death in Brazil. Literally. I’ll get to the Maracanazo in one of my future blogs but you will understand why Brazil has to win. And nothing less. Brazil has won the World Cup five times, more than any other country. They’re one country with such a legacy in football that anything less than the World Cup is unacceptable. In fact it’s the Maracanazo that Brazil no longer wears white. Brazil comes to this tournament not ranked #1. Actually they’ve been ousted in the quarterfinals these past two World Cups. However hosting the World Cup in a country that treats football like a religion would consider the loss of the World Cup like a stab at the heart. They have coach Luis Felipe Scolari who coached Brazil to win the 2002 World Cup heading the team consisting of veterans like Thiago Silva, Dani Alves, Jefferson and Frad as well as newcomers like Oscar, Bernard and rising phenom Neymar. Will they deliver to the challenge or will they choke under pressure? Already they started with a good win against Croatia 3-1 but just yesterday they had a 0-0 draw against Mexico. Makes me wondering if they found Mexico too much of a challenge or they were saving themselves for later. We’ll see. There isn’t a single team in the world Brazil can’t beat. However it is possible for some teams to beat them. Hope it’s not here. As you may have noticed when I did my blogs about the stadiums, I made comments about the construction problems that happened along the way. There were even construction fatalities like back in November when a crane inside the Arena de Sao Paulo toppled and killed two workers. This bad planning is nothing new in Brazil. Brazil has a habit of building things slower than expected. However it was already noted by FIFA as far back as 2011. Stadium expenditures were originally expected to cost $1.1 million. Instead stadium works cost $3.6 billion. Some of you may remember from the Confederations Cup that Brazil had six stadiums ready for that competition. There still six more remaining. FIFA gave Brazil a deadline of December 31, 2013 to have all the stadiums completed. Six were incomplete by that time. As you may have noticed in my group blogs, there were many stadiums that took until April or May for completion. Even the condition of the Arena de Sao Paulo was in question just 24 hours before it was to host the opening ceremonies and opening match. It wasn’t just the building of new stadiums that was the problem. Airports in many of the cities needed upgrading to cope with a huge influx of tourists coming in. Thirteen needed upgrading and it was predicted in 2011, ten would not be ready. That led to Brazilian president Dilma Rousseff to auction off many of the airports to the private sector. There were even monorail projects planned for many of the host cities but many were not completed. Some even had to be downgraded if they wanted to finish on time. In May 2014, FIFA reported that only 36 of the 93 major projects had already been completed. However FIFA secretary Jeroma Valcke did make note that many of the projects were meant to continue after the World Cup including ‘legacy projects’ sponsored by FIFA costing $20 million and coming completely at FIFA’s expense. 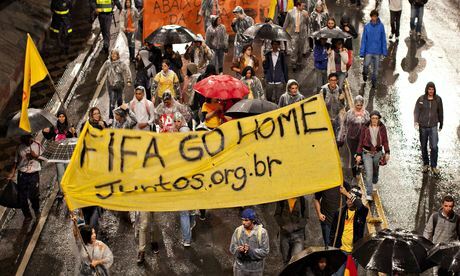 Just like during last year’s Confederations Cup, Brazilians continued their protesting around FIFA’s World Cup over its huge expense. After Pele’s quote, you may be asking how expensive is this World Cup going to cost? Well, not as expensive as the $51 billion Putin and his Russia spent on the Sochi Winter Olympics but high enough. Brazil’s World Cup comes at an estimated price tag of $14 billion: close to the $15 billion spent on the past three World Cups combined. $3.6 billion were spent on either building new stadiums or fixing them for FIFA regulations. The other money was spent on the infrastructure and transit projects that I just talked about. With them being unfinished, you may wonder what’s to blame? The spending or the poor planning? There was even an additional $900 million spent on security. It planned to have one police officer for every 50 spectators. Totals include 150,000 public security professionals and military along with 20,000 private security personnel. Other security innovations include facial recognition systems and unmanned security robots. Sure FIFA promised that they’d give $2 billion to the event but that can only go so far. Even Romario has described this World Cup as ‘the biggest theft in history’ which he believes expenditure will total $100 billion in the long run. Funny that this was not the case when Brazil hosted the World Cup back in 1950. Back then, they only needed six stadiums to contest the match and only two new ones were built. Funny how times change, especially in terms of huge sports events. You may remember I posted a blog about the protests happening around the time of the Confederations Cup. The protests were successful in bringing changes to Brazil in most areas, if not all. Back in the original blog I pointed out that Brazil is a developing country that has made a lot of developments and improvements in the quality of life in the past 30 years. I still stand by that belief however I won’t deny that there are still a lot of problems in Brazil still outstanding. The most notable being health care and rampant crime. In fact I saw a news story around the World Cup about growing up in the slums of Rio. Crime and gang problems are so bad even the police are afraid to go in to install law and order. It’s exactly like it was depicted in the 2003 film City of God. Brazil being a developing country determined to succeed does get reminders how they’re lagging in some areas and I’m sure will over time. The big protest focus around the World Cup has been about the government’s financial management of the company. I’m sure with a World Cup as expensive as that, you can’t blame them for being disappointed. One thing about the Confederations Cup is that both President Rousseff and FIFA president Blatter were booed before their speeches. Because of that there were no speeches at the World Cup opening ceremonies. Last years protests not only made news for them happening around the time of the Confederations Cup but also that the protests reached the stadiums. Protests leading up to the World Cup led to organizers stepping up its security. The security this time have been successful from preventing protests from reaching the stadium. It’s not to say it’s without noticeable incident. In fact two CNN journalists who were covering the protests around the June 12th opening game, Shasta Darlington and Barbara Arvantidis, were injured. 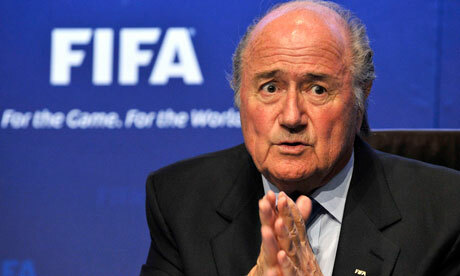 FIFA’s president Sepp Blatter has come under fire under allegations of bribery and corruption. It’s not just the World Cup that’s facing the heat. FIFA president Sepp Blatter has come under fire for corruption. Back in 2011, Qatar won the rights to host the 2022 World Cup. Lately there have been reports that Qatar paid for votes. It’s a wonder too for the World Cup to go to a country only 4,500 square miles wide and with a population of just over 2 million people. Qatar has denied any wrongdoing but the British paper The Sunday Times is insistent in their allegations. Already there’s talk within the FIFA membership with the most vocal opposition coming from head of the Dutch Football Association Michael van Praag and FIFA has conducted an investigation into the matter headed by FIFA investigator Michael Garcia. However it will not be handed to a FIFA jury until just days after the World Cup and Blatter says no decisions will be taken until September or October. The 78 year-old Blatter who has been president of FIFA since 1998 has always maintained that this term will be his last but already the media and certain members of FIFA want him to resign soon in the wake of the scandal and even five of FIFA’s six major corporate sponsors are demanding a thorough investigation of the allegations. FIFA has claimed it’s racism behind the accusations and Blatter himself has described the outcry as the “storm against FIFA” and “discrimination and racism” as most of those accused of accepting bribes are from African countries. The response to the scandal is something that will only be defined over time. So there you go. This is a taste of what’s in store for the World Cup. Sure there are the pressures on the field but lots off the field too. How those get managed are bound to get some healthy media attention. Some will even require time to decide its fates. You can guarantee even after the World Cup is finished and the winning team is crowned, neither FIFA nor Brazil will stop making headlines.